I received a free copy of this book from the publisher, Endeavor Press, in exchange for an honest review. The first thing that drew me to this book was the cover – it’s beautiful! Luckily, this book is a lot more than a pretty cover. When I started this book I was not aware that this is actually book #4 of a currently 4 book series. I didn’t realize that until about a quarter way in – I loved the writing and thought, why have I never heard of this author before? This is really good. I look it up on Goodreads and that is when I discovered it is actually a full series. I did not feel that not having read the first three books I was missing any information – I think you could easily read this as a stand-alone story or read the earlier ones out of order. I definitely plan on seeking out the other books in this series. The setting is in a small village in Victorian times which is quite gothic -something I love. You can almost feel the cold streets, the flickering candlelight and the hardships of the characters. There is a girl acting as medium, seances, a murder – what is not to love about all that? This was a completely enthralling mystery, classic in the sense of Christie or Sayers, complete with strong, smart detectives cracking the case. My only slight criticism would be that I wish there had been a bit more character development for some of the main characters, particularly Brennan and Jaggery; that is but a minor thing however and perhaps that is something that was taken care of in the earlier books. 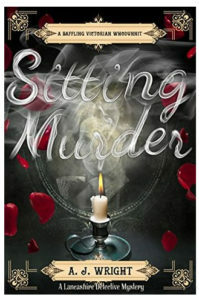 I am genuinely happy that I had the opportunity to read this book – thank you to Endeavor Press – I would definitely recommend Sitting Murder to anyone who loves a good mystery! What are your favorite mystery writers? I am always looking to discover new series in this genre – there is so much to love about them!